It is a noteworthy occasion when a composer gets the opportunity to revisit a work that helped put him on the map. 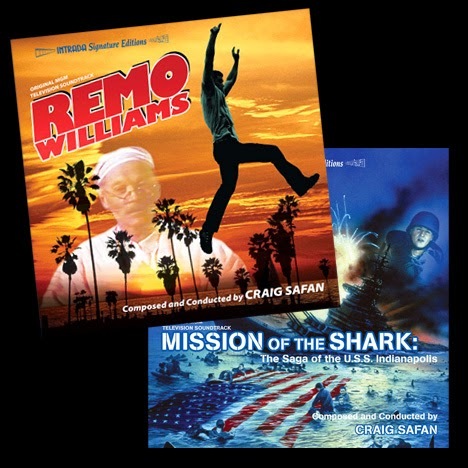 When Craig Safan rose to prominence in Hollywood during the 1980s, one of his first big hits was a thoroughly engaging score for the action-adventure film Remo Williams: The Adventure Begins (1985). Ultimately, the film's performance did not justify the expense of a big-screen sequel, but rather than abandon the franchise, the film’s producers decided to retool Remo as a television series designed to pick up where the theatrical film had left off. Craig Safan’s music for Remo Williams: The Adventure Begins had been a massive undertaking. He had composed almost the whole score on Synclavier. Then he overdubbed a 60-piece orchestra, and then on top of that overdubbed a smaller Korean orchestra. The smaller budget of the TV pilot reduced Safan’s ensemble to around 40 players—and instead of overdubs, the entire score was realized live on the scoring stage. The composer used synth and creative instrumentation to closely approximate the sound of the native Korean instruments that had been used for the theatrical film, and the result is a score that maintains a remarkable degree of continuity with its predecessor. Two principal themes from The Adventure Begins return in the pilot score. First is the main Remo Williams theme, which kicks off with a dynamic fanfare before moving into an energetic passage of pulsing synth and bright brass chords—all punctuated by a distinctive “ricochet” effect that the composer drew from his sample library. The other major returning theme is for Chiun: a lengthy, flowing line that rises and falls like a single meditative breath. Premiering three years after the Remo Williams pilot, the made-for-television film Mission of the Shark: The Saga of the U.S.S. Indianapolis presented Safan with very different subject matter. The film recounts the true story of an American heavy cruiser sunk by a Japanese submarine in the final weeks of World War II. The U.S.S. Indianapolis had just completed a successful mission when disaster struck. Of its crew of 1,196 men, around 900 survived the immediate aftermath of the sinking. But a series of tragic errors prevented the Navy from noticing the attack. By the time real help arrived, some five days later, there were only 316 survivors. Music would be vital to keeping the audience connected to the film’s emotional core. Safan crafted a noble theme in an Americana vein, emphasizing the tones and lush textures of a brass chorale. The film’s budgetary constraints, however, required a bit of cleverness when it came to orchestration, not allowing for the big brass and strings sections he wanted. To compensate, he creatively chose to composer for only cellos and basses—no violas, and no violins. To fill the resulting gap, Safan made subtle use of synth strings. The main theme highlights trumpet and horn, and much of the orchestration—with its sonorous wind writing throughout—suggests a concert band. The entire score is broadly drawn and rich with major-key harmony, but it is worth spotlighting “Shark Attack,” a decidedly aggressive sequence. In what may be the composer’s most dramatic sequence, the attack is intensified by incredibly dynamic low brass (particularly tuba) and percussion. It is a striking moment indeed in what is a powerful work overall.